There are a lot of snack options for children, and unfortunately, most have way too much sugar, hydrogenated oil, chemicals and other ingredients which are not healthy—especially for children. We should always try to feed our children the most whole food as possible, whenever possible. “Whole food” means something you would find in the produce section, like fruit, or a banana, or veggies. Whole food is always best for kids. When it comes to produce and fruit, organically grown food always has more flavor (and nutrition) than non-organic food, and so when it comes to getting the kiddo to try something new, go organic. Have you ever tasted a non-organic carrot and then bit into an organic carrot? I have, and the non-organic carrot can have a metallic taste, while the organic one is sweet. Truly, the perversion of our food supply does not help our kids one bit, and I think we’d all have better luck getting kids to eat healthier if we would feed them organically grown food. I have four healthy snack ideas for your kids which I hope you’ll find helpful. Note that I use sea salt in three of these healthy snack ideas. Sea salt is actually good for us, and good for kids too. Sea salt has trace minerals in it, unlike iodized salt, which is highly processed and pretty much poison. I give a complete discussion about iodized salt and sea salt in my book. Click the sea salt link to learn why I’m an advocate of sea salt and why I think we should use it in our food on a regular basis. I absolutely love the Fresh ‘n Nova Hummus. It’s a raw chickpea and tahini blend and they make quite a few flavor combinations. You can find this hummus at health food stores. For the organic vegetables I have carrots, zucchini, cucumber, red pepper, yellow pepper and jicama. Mx it up with other organic veggies. It really doesn’t matter – getting fresh, whole food like this into your kid makes this an excellent healthy snack (good for adults too!). 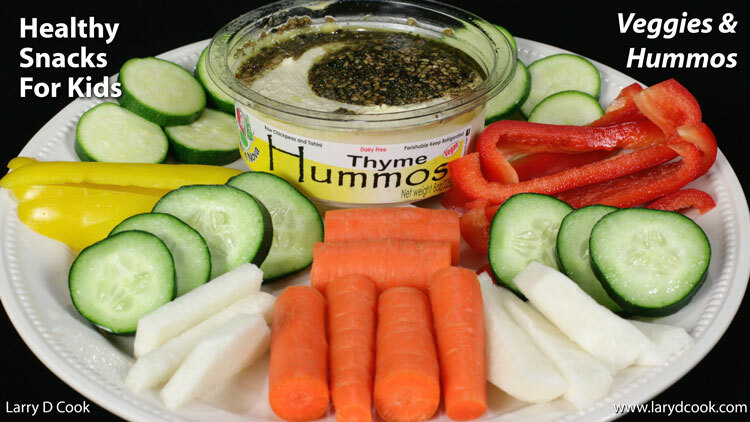 I love this combination and I’m sure your kids will love this healthy snack as well! Note that I use RealSalt™ sea salt because I really like it’s sweet flavor. There are several great sea salts on the market – find one at a health food store. For the apples, they absolutely should be organic. Otherwise you’re feeding the kiddos lots of pesticide residue which is quite toxic. Buy high quality apples that are crisp, like Gala apples or something similar. As for the nut butter, I like almond butter, tahini or peanut butter. But, don’t get any nut butter that has hydrogenated oil in it – that’s poison. It’s okay if you have to stir it! 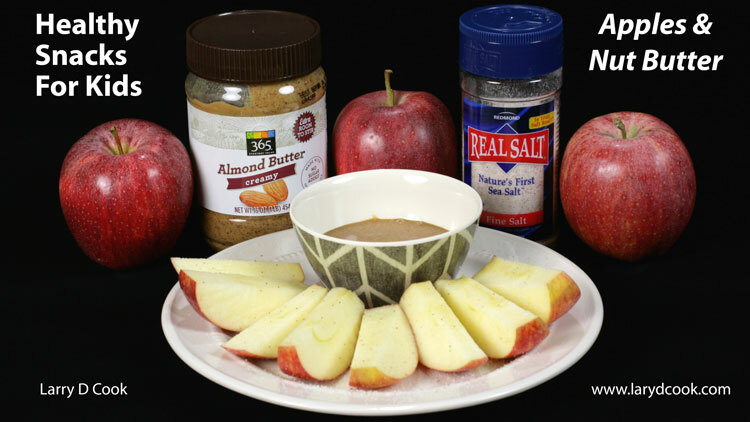 Organic apples, sea salt and almond nut butter makes a delicious and healthy snack for your child! I love the Doctor Kracker organic crispbreads. These crackers taste great, are all organic and are healthy. 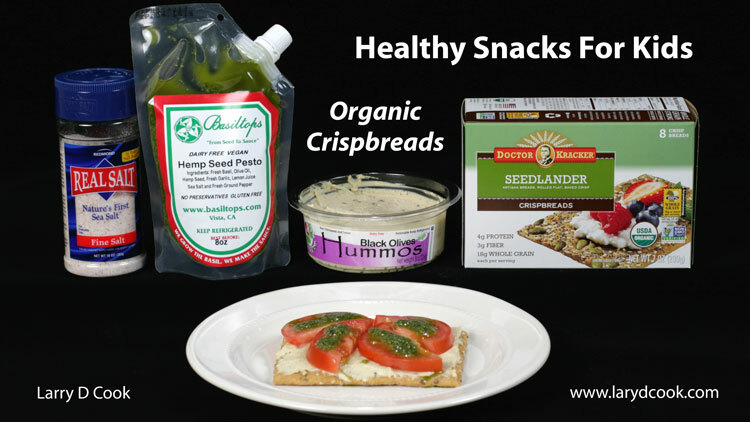 The Hemp Seed Pesto made by Basiltops is to die for! You will love it and I’m sure your kids will as well. The Black Olive Fresh ‘N Nova Hummos is delicious and healthy also, and I already talked about the seat salt. Slap this all together with an organic tomato and you’ll have a winning combination that your kids will love. Try heirloom tomatoes when they are in season – they are the best! What you see is a set of organic ingredients with no added sugar. The Eden Organic Apple Butter is sweetened with concentrated apple juice with no added sugar. The Santa Cruz Dark Roasted Peanut Butter is very delicious. The organic raw coconut oil by Artisana is not only delicious, but also very good for the body. And the rice cakes taste great too! A little sea salt brings all the flavors together. 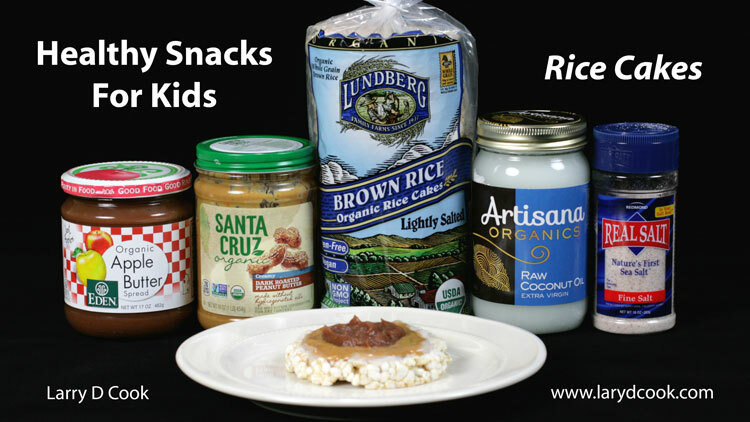 This combo is a great healthy snack for kids and far better than feeding them muffins, brownies or cookies! More filling and satisfying too. You can find almost all of these health food ingredients at Whole Foods, or local health food store.